Many landsmen have wondered - as Dr. Johnson did - what sort of men were the fore-castle-hands who took the old sailing ships to sea. In that calling they braved all the discomforts of a gaol, with the added chance of getting drowned. Those who take an interest in the old-time sailing ships often wonder, also, why the old generation - known as “shell-backs” - disappeared so suddenly. The truth is that the seaman was the product of the conditions in which he lived, and he changed when the sailing ship gave place to the steamer and motor ship Often enough the forecastles of later ships are not particularly comfortable, but their hardships and discomforts are as nothing compared with those which the sailing-ship man of the past took as a matter of course. His surroundings moulded his character, for good and for ill. GOING ALOFT. However uncomfortable the forecastle may appear to the landsman, it is a welcome refuge to the forecastle-hand after a long spell in the rigging. 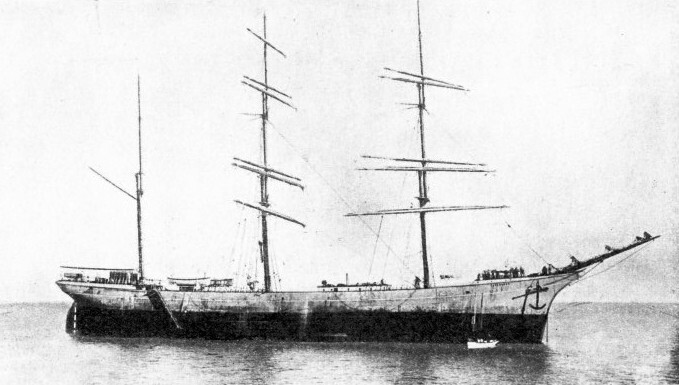 The photograph shows the Invercauld, a three-masted barque of 1,416 gross tons, which was sunk in 1916. When a man is living in one place for months, or perhaps for years, his environment has a large influence both on his health and on his mentality, and the old “shell-back” was largely made by the forecastle in which he lived. Much of the discomfort he endured was entirely unnecessary and could easily have been obviated with a little thought, not necessarily accompanied by great expense. British ships had a bad reputation, the blame for which is often placed on the regulations formerly laid down by the Board of Trade. These regulations were framed to ensure adequate deck space - nine square feet a man if they were sleeping in hammocks, and twelve if they were in bunks. This allowance was far less than the authorities stipulated for the common lodging-houses or “doss-houses” ashore. The parallel regulations of some foreign countries, which provided for cubic air capacity instead of deck space, were generally preferable. Other nations had no regulations at all, and then the accommodation of the seaman was left to the good sense of the owner. The question of health was generally neglected, although it was obvious that the healthy seaman could work better than the one who was ailing. Eating in the most uncomfortable conditions meant hurried food, and that had its effect on even such a hardy individual as the sailor. In British ships few of the forecastles had tables. There were some exceptions where proper mess-rooms were provided. Other ships had tables fitted to slide up and down stanchions, so as to be out of the way when not in use; but in most instances there were no tables at all, and meals had to be eaten on the man’s knees or on his sea chest. Tables were provided in Italian ships, even in the smallest; but, by tradition, the men preferred to eat their meals on deck whenever the weather was fine enough. To a certain extent the French followed this example. Mess gear was provided in many foreign ships, but in British vessels it was traditional for the men to provide their own. The mess gear generally comprised a tin plate and pannikin, knife, fork and spoon, and the “hook-pot” in which all liquids were served. The hook-pot was a pannikin with a lid, and resembled the canteen of the soldier. It held rather more than a pint, and had one or two hooks on the flat side by which it attached to the edge of a could be bunk. The man who was shanghaied (drugged and shipped) into the forecastle of a sailing ship, as so many were, had little chance of obtaining even these amenities from the crimp who had sent him to sea. His discomfort was increased accordingly, except for the charity of his mess-mates. Old cigarette tins and so forth served for margarine, marmalade, sugar or any food that was doled out weekly in accordance with the Board of Trade regulations. As a rule, the ship provided only the big wooden bread barge and the “mess kids”, in which the whole of the forecastle’s cooked rations were brought from the galley. 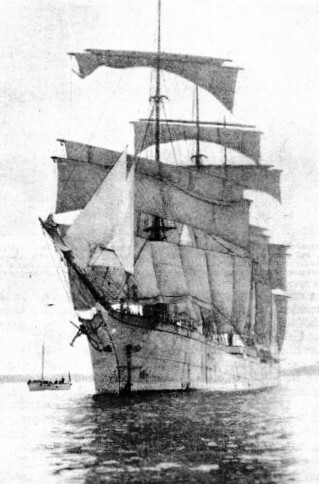 THE LAWHILL, a modern sailing ship, in which the forecastle-hand’s living conditions are far superior to those afforded the seamen of the past. This beautiful vessel belongs to the fleet of Gustav Erikson, owner of the Herzogin Cecilie. Steel-built, the Lawhill is a four-masted barque, with a gross tonnage of 2,816. The sea chest of the old sailor was such a feature in most forecastles, British as well as foreign, that it is worth describing. Sometimes it was quite elaborate, made of cedar wood and bound in brass. It was generally possible to get a really good sea chest for twenty shillings. Often the ship’s carpenter invested in a supply of wood when the ship was at one of the timber ports; he made the wood into chests on the way home. These he sold at a good price to his messmates or seamen ashore. Both men and boys took great pride in their chests, and spent much time in decorating them. The inside of the lid carried pictures of ships and geometrical designs, not, perhaps, of artistic merit, but neatly done and entailing considerable work; the handles were decorated with really beautiful rope work and the shackles with fancy knots. They provided excellent practice for the first voyager in one of the primary jobs of sailorizing. In French ships there was generally a lace-fringed cover to the chest, always kept clean however hard it was to get water. Sailormen referred to their chests as “donkeys”, because they were so difficult to ride in a seaway. In the old days it was an unwritten law in British, French, Norwegian and Swedish ships that to lock one’s chest was an insult to one’s messmates. If a chest were locked it was immediately kicked open. Other countries had other beliefs. The rule did not hold in port; the necessity of then locking the chest was acknowledged, and most of the seamen who had served in the East had ingenious native-made bell locks for the purpose. In later days the kit bag came into favour. For a long time the mates maintained that the old “reliables” had sea chests, while the youngsters and scallywags had bags, as they were much handier for deserting. Their increased convenience and better stowage, however, brought them into general use, and the sailorizing instinct of the men found an outlet in fancy rope designs worked into the bases. The men worked so hard that sleep generally came by sheer exhaustion, and the sleeping accommodation received but little attention. In the old days the men were accommodated in hammocks, Navy fashion. In some of the old North Atlantic timber droghers (timber carriers) the after bulkhead of the forecastle was unshipped to make room for the ends of the logs in the deck cargo. In these vessels the hammocks, one for every two men, were generally spread on the ends of the logs. American ships introduced bunks - “pews” the sailor called them - and this feature was copied all over the world. The bottoms were generally of softwood boards tongued and grooved - the worst possible harbouring place for bugs - and there was little enough comfort or air. The choice of bunks depended on the ship; often enough there was no definite system and the men chose their sleeping places as they arrived on board by throwing their gear into the bunk and so making it theirs by right. Sometimes the two watches, port and starboard, chose their bunks on the same system, to save disturbing a sleeping messmate when a man from the watch on deck went down into the forecastle to get anything. All prearrangement, however, went by the board when leaky decks made the upper bunks untenable, and each seaman had to “double-bank” with his opposite number in the other watch. In Norwegian and some other foreign vessels the bunks were always chosen by strict seniority, the oldest A.B. having the first pick and the boys generally being left with the uncomfortable lower thwartship bunks. The sailor’s usual mattress was the traditional “donkey’s breakfast” stuffed with straw: such a mattress could be bought for a shilling or eighteenpence in any of the seaport towns, and it was nearly always too narrow for a bunk of standard width. Because it was difficult to remain on when the ship was rolling it was often called a “razor strop”. British seamen generally provided themselves with two dark-coloured blankets and, sometimes, with a pillow, but they more often used their day clothes. Americans believed in making themselves comfortable, but most European countries followed the British example. The men sewed a piece of sail canvas between the blankets for warmth in very cold weather. The French substituted for straw a kind of sea grass. It was certainly hard, but had the great advantage of never being wet and always keeping sweet. 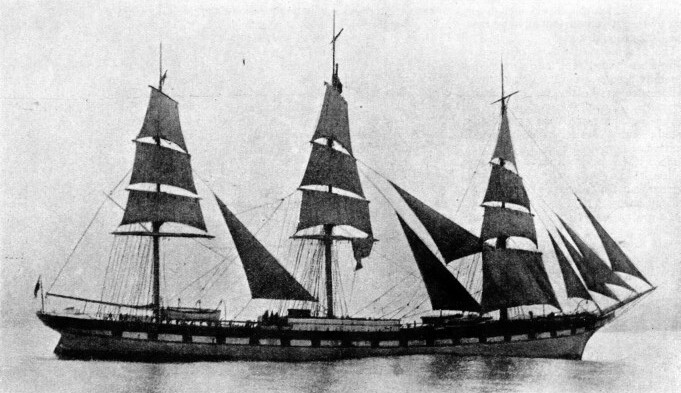 THE INVERNESS, a modern three-masted barque with good accommodation for the crew. The deckhouse, seen by the foremast, is divided into port and starboard forecastles, and each forecastle is subdivided into sleeping-quarters and a mess-room. This provision for the comfort of the crew is in strong contrast to the forecastle arrangements of the past. Then accommodation was often more restricted than that in a shore lodging house, tables and mess gear were lacking and frequently no heating was supplied for drying clothes soaked by heavy seas. With such gear it was generally necessary for the men to sleep in all, or in most, of their clothes. Under the Laws of Oleron, framed about 1190, it was a serious offence to undress during a voyage. Many Continental seamen, however, preferred to undress for sleep, and the French favoured a flannel night shirt of astonishing thickness, and nine times out of ten of a vivid red colour. The modern sailing-ship hand who takes pyjamas, and even tooth-brushes, to sea is the target of unending gibes from the old seamen. One quite unnecessary feature that once made for great discomfort was the windlass inside the topgallant forecastle. The cables led through the hawse-pipes in the forward end of the men’s accommodation and down into the locker through holes in the deck. After the ship had been anchored on a muddy bottom a quantity of malodorous filth came into the forecastle with the cable. 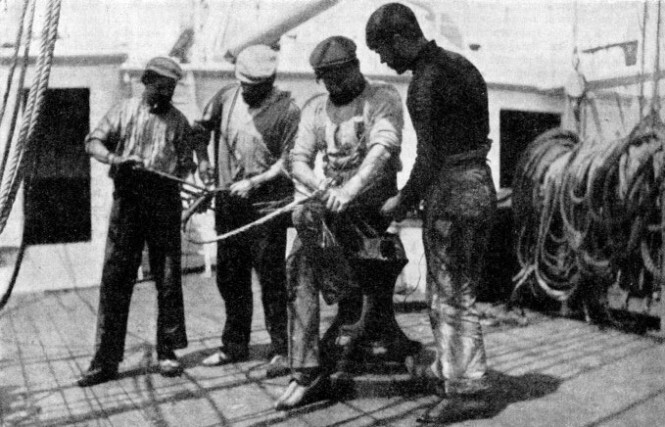 At the beginning and end of the voyage, when it was likely that the ship would be pitching heavily in Channel seas, the hawse-pipes had to be left open while the cables were shackled to the anchors. 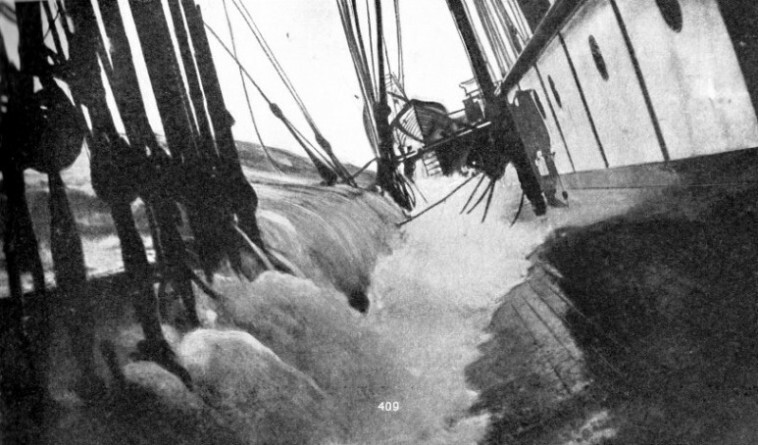 This allowed much water to come straight through into the forecastle, only a small portion being diverted by the breakwater built across the deck. 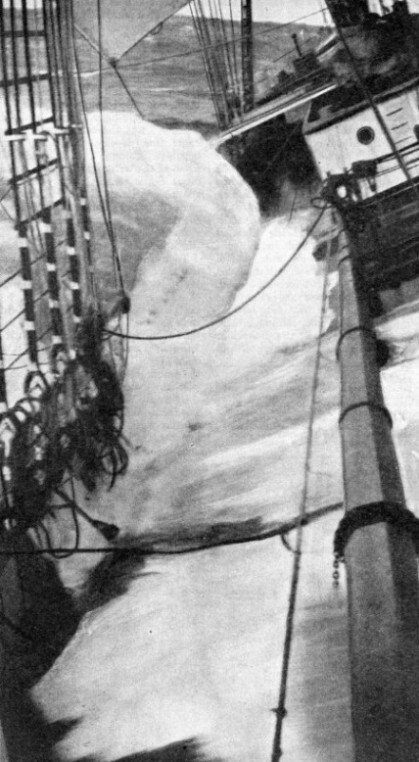 When the ships were out of soundings the anchors were unshackled and made fast on the forecastle head, the cables were drawn inboard and the hawse-pipes plugged with long wooden plugs on a wire toggle. Although these plugs were made to fit the pipes with canvas and cement, a really watertight joint was almost unknown; even the best let in a good deal of moisture, but the majority did not even keep out “solid water”. In some ships - for instance in the Pass of Brander, Bannockburn, Clackmannanshire and many others - an improved type of divided top-gallant forecastle was built. One watch occupied either section, with the hawse-pipes and windlass - the “piano” was the sailor’s most polite name for it - in the open space between. Through this space also the worst of the water went on to the main deck. Some found its way into the accommodation on either side, but little compared with the amount that went into the ordinary forecastle. There was also a chance of drying wet clothes over the winch in the alleyway. To live in any top-gallant forecastle was a hardship. Food going to it from the galley was liable to be washed overboard ; it was directly over the fore peak, in which the beef and pork barrels were stowed. Their odour, mixed with that of old rope and tar, made the air so foul that it was dangerous to take down a naked light. In addition, the sleep of the watch below was disturbed whenever stores were brought up for use. Generally the deckhouse forecastle was far more comfortable and far more popular with the men, although for many years it was comparatively rare in British ships. Numerous foreign ships had it as a matter of course and in addition provided separate forecastles for each watch, with a comfortable mess-room and facilities for drying clothes. Swedish and German deckhouse forecastles were among the best. Those built of wood were preferred, as they were warmer in cold weather and cooler in summer. Steel deckhouses became terribly hot in the tropics. SHIPPING A HEAVY SEA. One of the principal disadvantages of the deckhouse forecastle - as seen on the right of the photograph - is its occasional inability to withstand all types of weather. When heavy seas are running, its sides are often stove in. Such deckhouses have sometimes been swept bodily overboard in severe weather with the hands inside. A development of the deckhouse forecastle was the “Liverpool House” or “midship house”, stretching across the full width of the ship. It gave better accommodation, and was only occasionally flooded, but it had disadvantages. It was much in the way when the ship was being worked, for there was no direct path through it. The crew had to climb up and down ladders when going fore and aft. As a rule entrance was from the upper deck only, with small ports at the sides, making it difficult to ventilate in the tropics. All deckhouse forecastles except the Liverpool house were exposed to the risk of having the sides stove in by heavy seas; in unusually bad weather some of them were swept overboard bodily with the seamen inside. One of the greatest - and often unnecessary - hardships of the sailor was wet clothes. In France the law demanded that captains should give facilities for drying clothes, either in the galley or in the donkey house. In Bordes’ big nitrate carriers a special tank was provided for rainwater in which the salt could be washed out of clothes before they were dried. In many British ships there was not only no space in which to hang clothes, but also the men were not allowed to dry them in the galley. The clothes would often be wet through for weeks at a time, an occasional wring-out being all that was possible. This caused both cramp and rheumatism. The wearing of clothes wet with salt water also caused painful boils wherever the clothes chafed. Poor food was a contributing cause to these boils. An almost certain cure was two or three fresh onions or a lemon, but they were seldom obtainable. The possibility of sailors catching a chill when they went on watch was generally used as an excuse for not providing adequate heating facilities in the forecastle. A small bogey stove was all the heating apparatus that was generally found; but sometimes even this was omitted. Improvised bogeys were easily made with a paint drum and a little piping, but they were apt to be extravagant in fuel, and fuel was difficult to get. Even their small heat was a great comfort off the Horn; but, while such a stove dried the place to a certain extent, it put the forecastle in a state of continuous fog. It woke up the bugs, normally inconspicuous in those waters, and the back wind from the sails always prevented it from drawing properly. The argument as to whose job it was to clear the ashes, if there happened to be no boy, to whom the work went automatically, often led to so much bad feeling that the stove was thrown overboard to restore harmony. The men’s quarters were lighted as badly as they were heated. For natural light there was the scuttle, closed in bad weather to prevent heavy water from coming down; there were sidelights frequently, but occasionally only bullseyes in the deck. Artificial lighting in many forecastles was provided by a “slush lamp”, generally a preserved meat tin filled with fat from the galley, begged or stolen from the cook. The wick was made from the shredded canvas of discarded sails. The name “slush lamp” persisted after colza oil had been substituted for the galley fat, and paraffin for colza. When there was a proper lamp some captains objected to it on the score that it endangered-the ship from fire. They took it away as soon as the ship was out of soundings, and did not return it until the end of the voyage. Other masters supplied so little oil that the lamp could be kept alight only for a short time while watches were being changed. Getting extra supplies of oil and replacing broken glasses were among the constant problems of the forecastle. It was usually necessary to call in the assistance of one of the apprentices whose job it was to rouse the officer of the watch. He generally slept soundly. Before he was properly awake there was the opportunity of “milking” his lamp of the greater part of its oil, while the pieces of broken lamp glass were always carefully preserved to be scattered on the deck of the officer’s cabin, his own unbroken glass being extracted and taken away forward. Foreign ships were better supplied with illuminants than British. In some trades, notably the China trade, ordinary lamp oil was often difficult to get, and coco-nut oil or ceara wax was used instead. Either congealed in cold weather and had to be melted down in a kettle before it could be used; ceara in particular was difficult to light in low temperatures, and nearly all such substitutes gave out more smell and smoke than light. 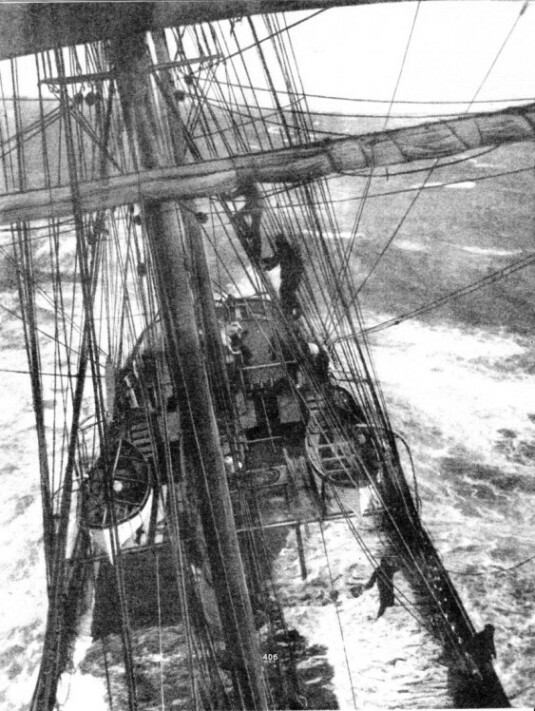 The ventilation of the crew’s quarters did not present so many problems to the owner, for the sailing ship man hated fresh air in any circumstances - he got quite enough of it in the course of his ordinary work - and if ventilators were provided they were quickly stuffed up with an old pair of trousers or an overall. Another cause of infinite discomfort in the forecastles of the old sailing ship was vermin. Some cargoes and some trades were worse than others. Coal cargoes, which occupied so many sailing ships, brought thousands of fleas on board, for no apparent reason, as did also the wool cargoes from Australia. In hot weather the fleas came up the ventilators in hundreds and when the hatches were taken oil all hands were scratching. The bone trade from the River Plate to the Mediterranean was a particularly unpleasant one; fragments of meat were generally adhering to the bones when they were shipped and bred maggots that penetrated everywhere, not only into the living quarters but even into the harness cask and bread barge. Weevils were expected in the hard biscuits, “Liverpool pantiles”, and the like, which were dignified with the name of bread; they were easily knocked out by rapping the edge of the biscuit sharply on the table. Compared with bugs, the cockroaches that infested nearly all sailing ships were regarded almost as domestic pets by the men; they were comparatively harmless and were generally called “domestic animals”, or “fresh meat” if they found their way into the food. They even appeared on board a brand new steel ship, although it was a puzzle how they got there. There is an old fable that cockroaches and bugs will not live together, but any old “shell-back” can contradict that story from his own experience. Bugs were, perhaps, the worst trouble in the forecastle. Few ships were free of them; they were always liveliest in the tropics, where by their numbers and attentions they drove the men to sleep on deck. The cold weather off the Horn killed the bugs. This was the only good thing that could be said about Cape Horn weather. A curious instance which was much discussed in forecastles was that of the barque Clydebank, whose crew suffered badly from dengue fever. The bugs, which had defied all attack until then, died out completely, and there was not a sign of one on board the ship for the next two years. Some careful captains had the forecastle completely turned out every Saturday morning and painted with creosote, but as a rule that was only a partial cure. The old sailor maintained that the only thing to kill bugs was paraffin. A common device was to allow the paraffin to run down the seams of the woodwork. It was then set alight. One or two hands stood by ready to beat out the flames if the safety of the ship was threatened. As every shipmaster was by hard experience nervous of fire, this method of exterminating “livestock” was disliked officially,but it was generally employed. The usual official method of fumigation was to bring a chain up to red heat and dip it into a bucket of tar in the forecastle, making the quarters chronically uncomfortable, for men as well as for vermin. This practice was the cause of many disastrous fires, for a bucket is easily capsized in a violently pitching ship. Although cockroaches, bugs and the like were regarded with complacency in practically every forecastle, the seaman who was personally verminous committed an unforgivable crime, and his messmates undertook to cure him. Rats were so prevalent in the old sailing ships that the proverb about rats leaving a sinking ship became worldwide. Probably the reason was that the unseaworthy ship gave plenty of notice of the approaching disaster. In moderation these vermin provided diversion, since rat hunts made a break in the monotony of the voyage. The forecastles themselves were generally kept clean by the men’s own desire; if the afterguard did not give the men the opportunity as a job of ship’s work, the forecastles would be scrubbed out during the Saturday morning watch below. Nowadays, of course, the numerous inspectors of the various Port Sanitary Authorities take the greatest pains to ensure that the seamen’s accommodation shall be kept clean. You can read more on “The Last of the Giants”, “Romance of the Racing Clippers” and “Speed Under Sail” on this website.